In my inaugural Favourite Eateries blog post I gushed at length about The Tavern Co in Liverpool. This time, I bring you something completely different – we’re ditching the tex-mex breakfast food and heading to the Iberian peninsula via Lunya in Liverpool. With independent, family-owned restaurants in both Liverpool and Manchester, Lunya is Peter & Elaine Kinsella’s homage to Catalunya and Spain. Lunya is a combination of Catalan restaurant, deli, and bar, and they are multi-award winning, with the Liverpool restaurant featured in the Good Food Guide North West as Restaurant of the Year for two years running (2015 & 2016). 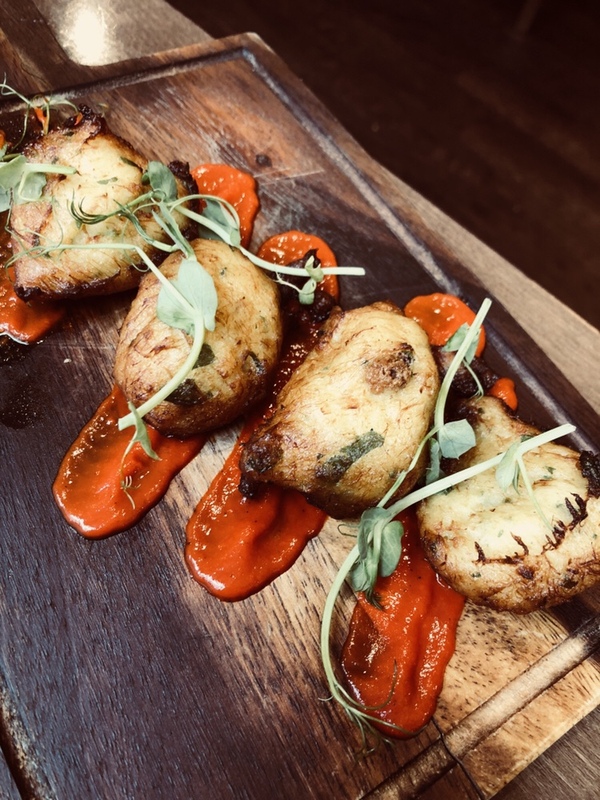 Located on the corner of College Lane and Hanover Street, opposite Radio Merseyside, Lunya is best experienced when you have plenty of time to eat in Catalan fashion, that is to say: slow and social. If you’re looking for a quick get-in-get-out meal I would not recommend the Catalan restaurant, but if you’re happy to sit back, relax, and have some seriously tasty tapas brought to your table as and when it’s ready, then Lunya may well be the place for you. We visited in the afternoon, and despite the slightly unusual meal time, the place was still quite full – this, to me, is usually a good sign. But there wasn’t any sense of busyness in a frantic sense, it was just bustling with people enjoying their food and drink and making an afternoon (and maybe an evening) of it. Straight away, I knew I would like Lunya and we’d only just been shown to our table. 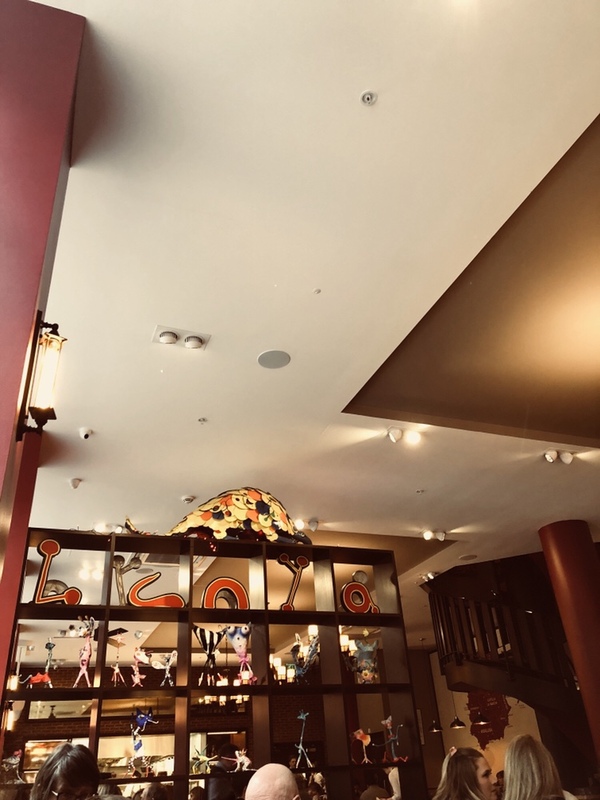 Staff are extremely welcoming and helpful – our server asked us if we’d been to Lunya before and then explained, essentially, how tapas works as she showed us the menus. It wasn’t patronising in any way, it was helpful as she advised how many tapas would be suitable between our party size. 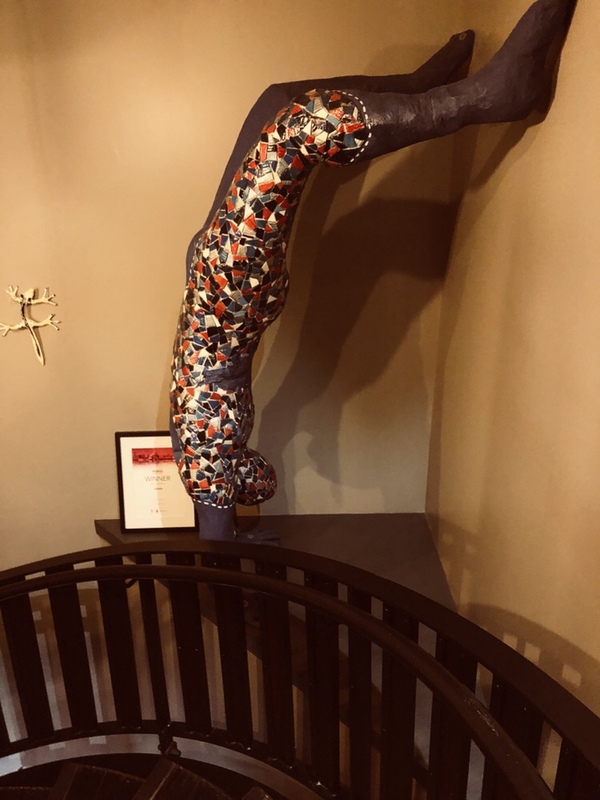 We were already pretty certain how many we wanted, and even what we were likely to eat, but it’s good to feel welcomed and given a quick idea of how it all works to really feel at home. We decided to start with bread, oil and vinegar, partly because I am a fiend for sourdough. The bread, still warm and clearly freshly made, arrived and I couldn’t help but snag a slice even before the oils arrived. And when the oils arrived? Boy did they arrive, in a wooden box, and the server took us through the different types of oils and vinegars and asked which three we wanted to try. It was very obvious that all of the waiting staff are extremely knowledgeable about the food they’re serving and they’re passionate about it too, and want to make sure you get to try dishes you’ll like. 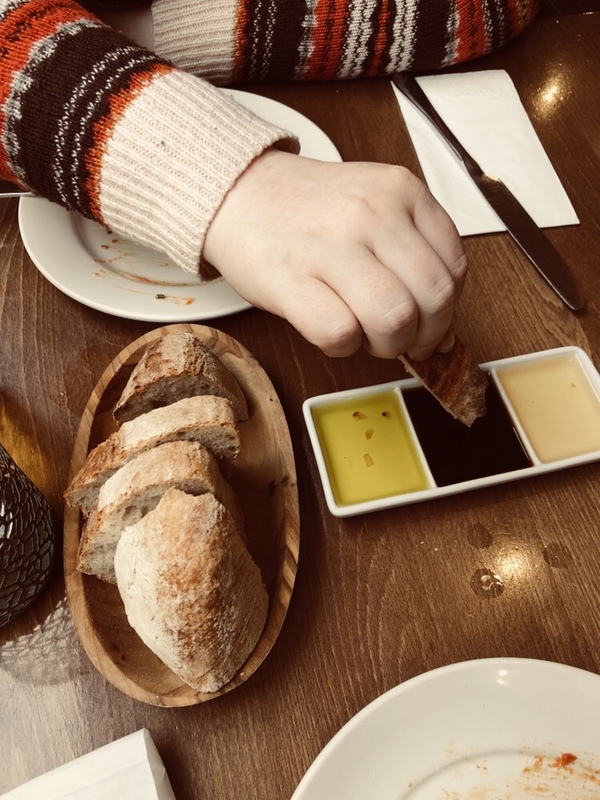 Our server asked if we liked balsamic vinegar, and then recommended what he described as a sweeter example – so we ended up with olive oil infused with garlic, balsamic vinegar, and a moscatel vinegar. His recommendation was brilliant because I loved the moscatel vinegar – I felt like I could dunk bread in it all day and not tire of it! We also ordered some habas picantes which are described as spicy crispy baby broad beans. I love habas fritas which I’ve previously bought from supermarkets, and these were wonderful. To me, habas picantes are Spain’s solution to the fact I love snacking but struggle to find savoury snacks because I don’t eat nuts which, it seems, are the main savoury option widely offered. Spain has me covered though, and I love habas picantes because of it. It was good to be able to order those and munch on them as we waited for the next plates of tapas to appear, and to finish off the meal as we waited for the bill to be brought over. Speaking of tapas being brought over, we couldn’t go to a tapas place and not order patatas bravas. 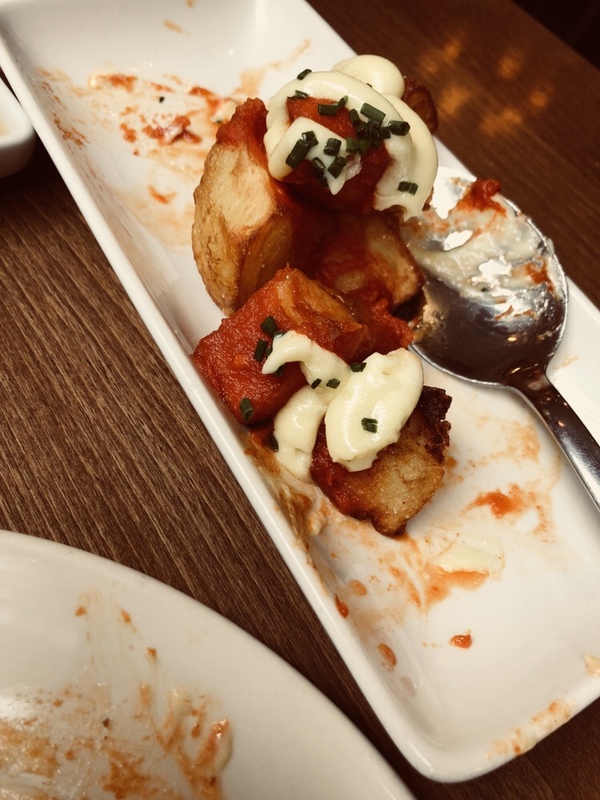 One of my favourite options, Lunya’s version of this famed Spanish tapas was certainly not a disappointment – the patatas were perfectly crispy on the outside, deliciously (but not overly) oily, with a lovely spicy tomato sauce and allioli to accompany it. The fact I forgot to snap a photo until we’d already tucked into the plate pretty much says it all! Speaking of dishes that were too tasty for me to remember to take a photo before we tucked in, my friend is a fiend for hummus so of course we had to indulge her penchant. We ordered the Piquillo pepper hummus with breadsticks and flat bread which was yuh-m! By this point I definitely felt like I’d already ate my own weight in bread, but I didn’t exactly mind that fact because it was so damn tasty. Quite luckily, after a couple of cold tapas dishes, and the patatas bravas, we had a short reprieve as we waited for the next hot tapas dishes to be cooked. We’d made sure to order veggie and meat dishes, and I argued for adding a fish dish into that so we could have a “fish course” of sorts, and I was really glad we did because that brought to our table the bacalao buñuelos. These are described on the menu as light fritters of salt cod and herbs with a vibrant roasted Piquillo pepper sauce but all I can say is these were light and the cod tasted so fresh and the crispy outside made for a light and easy texture, and was a nice reprieve after the heavier carbs I’d already stuffed my face with. But, of course, you can never have too many carbs or, indeed, too much meat so next we moved onto crispy chicken. I must admit, when this arrived, I had no idea what on earth I was in for. 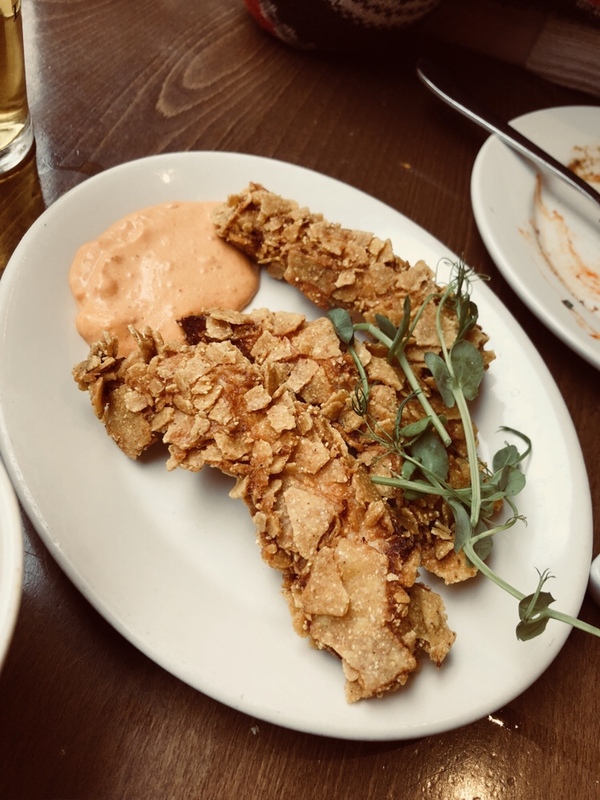 It’s effectively chicken strips coated in smashed up tortilla chips and served with “Catalan dip” – I don’t know what that is but I do know it’s yummy. I wasn’t sure how I’d feel about tortilla chips coating the chicken, I like chips just fine but didn’t get how they’d work as a sort of batter for chicken but oh my gosh I was wrong, they really do work, and very I’m sorry I ever doubted it for even a split second. And, finally, the last tapas we ordered was a little bit of Catalonia meets Liverpool by way of Catalan Scouse. 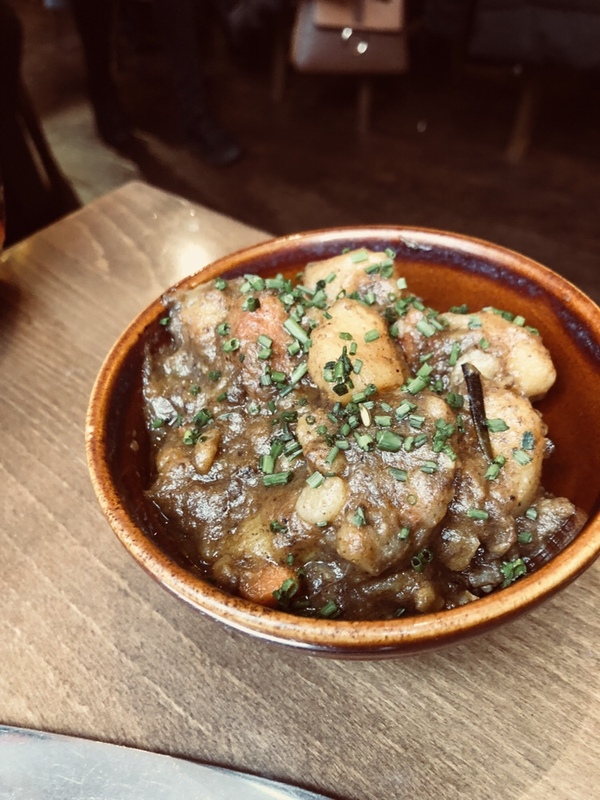 Think of your typical Scouse stew, complete with potatoes, carrots, and onions, and then substitute whatever meat you’re accustomed to using with chorizo and morcilla instead. It was so rich and tasty and it’s a combination that absolutely 100% works. The fattiness and spiciness of the chorizo helps to cut through the potato and carrot and whatever seasoning they use is undoubtedly a closely-guarded secret but wow it’s damn good. It was worth every single minute of the food baby I nursed after I’d finished off the portion and sank into a food coma. It would be remiss of me not to offer a conclusion of the experience of eating at Lunya but suffice it to say, their food is damn tasty and worth every calorie/penny. Their staff are so welcoming and lovely and they’re knowledgeable about the food they’re serving too so you feel safe in asking for recommendations if you’re not quite sure how it all works or what food you might enjoy – or, indeed, you might feel confident enough in their food to just say “bring me six tapas of your choice” as someone at the table near ours did! I’m a fiend for chorizo and jamon serrano and all things patatas bravas, so I was always going to enjoy this little slice of Catalunya tucked away in Liverpool, but my only question is how did I wait so long before going to eat at Lunya? A grievous error – and one which I’m sure I’ll be putting right with many a trip back there in the future!